This circular park is built on a hill and at the top is a spectacular view. Also at the top is a tennis and basketball court, and a flat ball field. On the side of the hill is a children's playground. 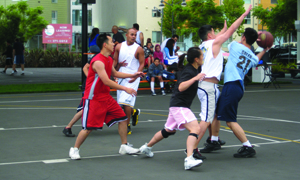 Holly Park is owned by the San Francisco Recreation and Parks Department. It was a seven-and-a-half-acre parcel on the Bernal Rancho in 1862 when San Francisco's colorful high roller/miner James Fair bought it and deeded it to the city. Its price - $375,000 - scarcely dented the $45,000,000 fortune Fair had made from his silver mines (and devoted to new real estate holdings and famously high living). The site lay unimproved until 1887 when development began in the Holly Park District. Roadways were graded, streets opened, sidewalks paved; and, by 1889, 200 houses and families had sprung up in the area. But people lacked a way to climb to the hilltop, 274 feet above. Under persistent pressure from the Holly Park Improvement Club, Holly Park Circle (then Holly Park Avenue) was built and opened in 1874. 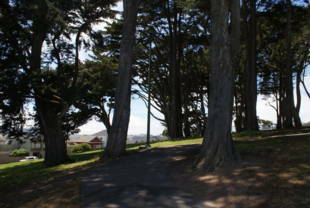 Now families could have an outing in their own neighborhood instead of making the long trek out to Golden Gate Park. Trees and shrubs held their ground in the park until April of 1929, when the Playground Commission requested a playground and asked the Park Department to clear away shrubbery and put in basketball and tennis courts. 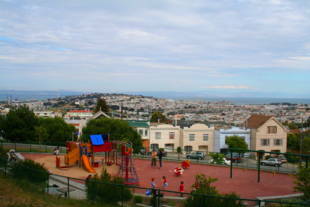 In 1954, archives in the Planning Department record the proposal to create a hilltop park in Bernal Heights and Holly Park joined the roster of neighborhood parks/open spaces. Maintenance and piecemeal improvements, which began in the '60s, have carried on into the late '90s, always leaving more to be done. 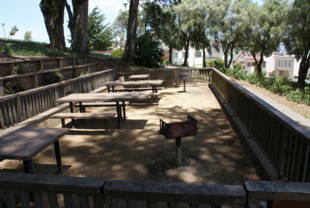 The '70s saw grading, paving, irrigation repair and rehabilitation of the children's playground. In 1971, Rec and Park gave it the much coveted surplus fire engine that was to be converted into a piece of play equipment and donated to a city park. Fast forward to 1989 and a program of repair (irrigation system), removal (cuttings, bushes, glass in the playground), and promises (picnic area cleanup and baseball diamond renovation). 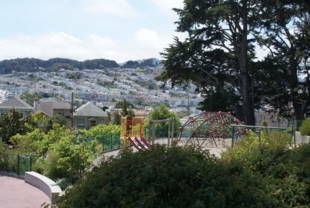 In 1991, the South Bernal Neighborhood Association submitted to San Francisco Beautiful and the Neighborhood Graffiti Clean-Up Fund a proposal for a Holly Park Sculpture Playground. They were turned down but encouraged to resubmit the following year. Also in '91, concern about the park's hazardous conditions prompted Rec and Park to fence the children's play area, playing field and BBQ area, and upgrade lights. In April '96, a grant for water conservation funding included replacing the baseball field grass with a cinder/clay mix, installing wood chips on high traffic areas, eliminating landscaping in erosion areas, and replacing irrigation heads. A year and a half ago in her early morning walks around the hill, Eugenie Marek noted the condition of the picnic tables and benches, barbecue pit, children's play structures, tennis and basketball courts and baseball field. Aware both of the park's deterioration and the 10-year, $110 million Capital Plan allotted to facility improvement from the passage of Propositions A and C, she resolved to start up Friends of Holly Park. She sought the Neighborhood Park Council's advice and set up a meeting to inform the community and enlist its support. Two activist friends joined her in working with Junipero Serra Elementary School for the children's wish list. A $2,000 Beginner's Grant from Friends of Rec and Park paid for a booth at the annual Fall Fiesta and printing flyers for a new summer recreation program and a questionnaire on park priorities and preferences. The 200-plus responses formed the basis of the Holly Park Improvement Proposal submitted to the Recreation and Park Department in October. Good News! They got $1.5 million for facility and short-term projects which translates into reforestation and ADA compliance in the Capital Plan's Year Two. Their landscape architect, Susan Lucchi, is on the case and after surveying the site and the Improvement Proposal held her first community meeting in mid-November.